Archeologists in Turkey think they may have reason to rewrite Christian history. Saint Nicholas, the inspiration for Santa Claus, is believed to have been born in the Demre district in Antalya, and new research at a church that bears his name there has uncovered a tomb that could house his undisturbed remains. 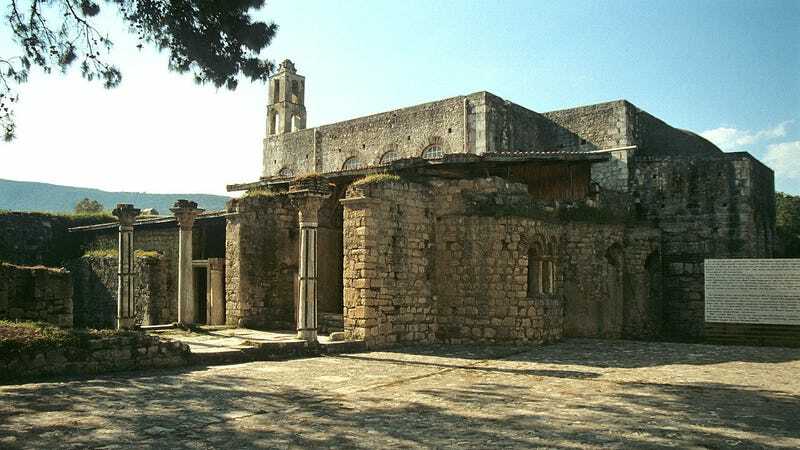 On Wednesday, Cemil Karabayram, the head of Antalya’s Monument Authority, told the Daily Sabah that his team has searched through historical records relating to the St. Nicholas Church in Demre and found reason to believe that the conventional story about what happened to the remains of Saint Nicholas could be wrong. The saint is believed to have been buried at the church before it was damaged in an earthquake. According to one account, Italian merchants stole his bones from a damaged sarcophagus (pictured above) during the first crusade in 1087 and brought them home where they’ve been stored at the Basilica of Saint Nicholas in Bari, Italy ever since. Each year, on December 6th, the clergy collects a clear liquid that seeps from the tomb that is believed to have miraculous powers. Some believe that the liquid is seeping in from outside the tomb, which is below sea level. But if people really are collecting some nasty liquid from a dead guy’s bones, it might be the wrong dead guy. Working with researchers from eight different fields of study, Karabayram says that an elaborate tomb was discovered beneath the St. Nicholas Church in Turkey after performing digital surveys. Karabayram believes that the men who removed Saint Nicholas’ bones mistakenly picked up the remains of a different priest, making it possible that the real St. Nick is still underground. It’ll be some time before the researchers can get any closer to confirming the theory. “We believe this shrine has not been damaged at all, but it is quite difficult to get to it as there are mosaics on the floor,” Karabayram told the Daily Sabah. The tiles will carefully be removed together in a mold for preservation. Karabayram’s team certainly appears to have made a historic find, but there’s plenty of reason to believe that the connection to Saint Nicholas could be wishful thinking. While the real saint is historically confirmed, everything surrounding his story is packed with myth and tall tales. His transformation into Santa Claus, the gift-giving icon of Christmas, began with traditions celebrating folk tales surrounding his life and miracles he was said to have performed. He was known for giving generous gifts to young people and the gradual transliteration of “Saint Nikolaos” gave the figure his modern name. Several locations around the world have claimed to have some of St. Nick’s bones, but the Catholic Church has treated the Basilica in Bari as the true keeper for quite some time. In 2013, a Turkish group went as far as to write to Pope Francis requesting that the saint’s remains be returned to their original home. While that group may have had a genuine interest in preserving the region’s history, there’s also plenty of financial motivation. St. Nick’s old hometown is firmly Muslim and doesn’t celebrate Christmas, but residents are happy to promote his origin story because it brings in tourism. “We are so happy with Saint Nicholas,” Baris Yuksel, a shopkeeper in Demre told CNN. “After lots of centuries, we are earning money thanks to Saint Nicholas.” This didn’t escape Karabayram’s attention and he told the Turkish press that if Saint Nicholas’s remains are found, it could have quite a positive impact on tourism. Whatever comes of the dig, it’s fitting that a man who might be the most widely-mythologized saint in history will soon have a new story for scholars and clerics to dispute.